You bet, kids…but it’s a quick one. You know him, you admire him…hell, some of you heathen monkeys even fear him! It’s ROGER “RACE” T. BANNON! This man was my hero for years. Learn a little something about one of the toughest men to ever be animated! I never realized it until fairly recently, but Race Bannon and most of Jonny Quest is pretty much straight out of Doc Savage. I’ve been getting into the Doc the last couple of years, I probably have 50 of the paperbacks. Pretty cool pulp stuff. Jonny Quest is a pretty awesome adventure tv show. You could never do it now. No asian villians, kids with guns, nazis, old school natives. Remember Race’s hot lady friend, Jade? It originally aired in prime time and when the reruns were airing on Saturday mornings they pulled it, just for the reasons you mentioned. I never got into Doc S. but the book covers always caught my eye as a kid…I wanted them to be comics. Did you ever read Planetary? It had a Doc Brass based on Doc S.
What’s up with this 1975 film? It’s a fairly goofy George Pal flick. Entertaining but dopey, pretty tongue in cheek. I have a vhs, I don’t think it’s on dvd. When I was 11 the tv commercials for it were pretty exciting. 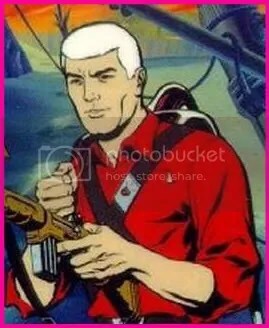 OK, Race Bannon is simply the hottest cartoon ever. EVER. I’ve been in love with him almost as long as I’ve been in love with Parker Stevenson! Yeah, that long. So a little info about Jade… in this one episode there are two Race Bannons. The real one and an imposter sent out by Dr. Zen (Zin?) to do some evil bidding. The real Race is kdinapped and only Johnny and Haji seem to see the difference. Jade shows up and they tell her they think he’s a fake and she’s all “Silly boys,” or something and then she sees Race and kisses him. And she was right. It was my first lesson in womanhood. Anybody know what happened to the guy, Mike Road, who did Race Bannon’s voice? He’s alive and retired. Anything else? Hey Jan, I sure don’t…I didn’t find too much info on the internet other than the various screen credits. Bwana, you never cease to amaze me with stuff like this…do you know what happened to Mike Road?